Jaffe–Campanacci syndrome (JCS) is a rare condition with various clinical pictures including bony lesions as nonossifying fibroma (NOF), skin pigmentation, and other rarer abnormalities. The exact etiology has not been completely understood., Skeletal involvement is the most prominent and debilitating feature of this syndrome, and pathologic fracture is a common initial presentation. 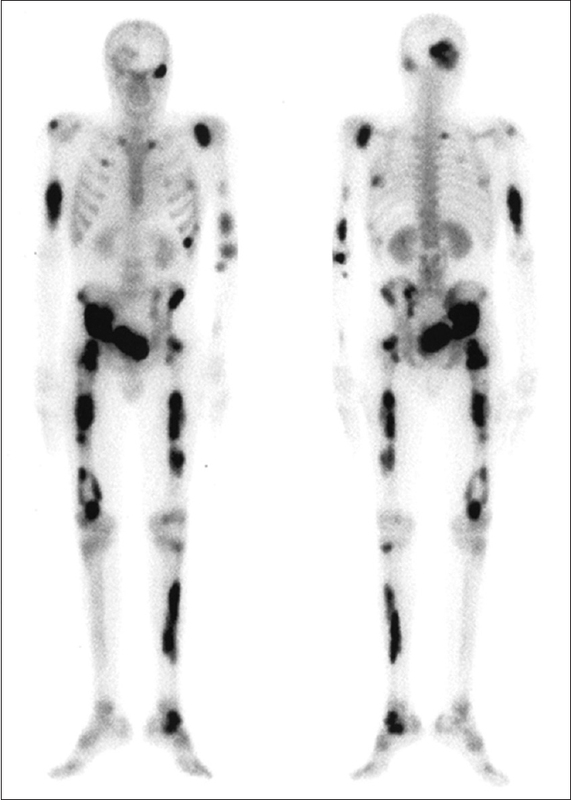 Although X-ray seems to be the modality of choice for diagnosis of bony lesions, radionuclide imaging may also play a role mostly for evaluation of extent of the disorder. We present a case of JCS evaluated with99m Tc-methylene diphosphonate (MDP) bone and99m Tc-octreotide scans. A 27-year-old male presented to the emergency department with a fracture of the right femur following a motor accident. During imaging workup, a fracture with an underlying soft-tissue mass was detected. On histopathological examination, an NOF without any pathologic evidence of malignancy was reported. The patient underwent an orthopedic surgery for the femoral fracture. Three to four months later, following a persistent nontraumatic right arm pain, another lesion with similar pathologic result was discovered during workup. Meanwhile, the patient stated episodes of bone pain and fever as well as malaise which was gradually worsening over the preceding months. A99m Tc-octreotide scan was requested on which multiple zones with varying degrees of uptake throughout the body were noted [Figure 1]. For better localization of the lesions, a bone scan was performed subsequently which showed a similar pattern with very intense uptake in the mentioned regions [Figure 2]. Alongside, faint hyperactivity was discovered in the thorax above the region of the heart. The computed tomography scan of the chest shortly afterward demonstrated a mediastinal mass invading to major vascular structures. On pathology, a low-grade soft-tissue sarcoma was found, and then chemotherapy was commenced immediately. A few months later, the patient expired. JCS is a rare genetic disorder whose etiology is not clearly understood. Historically, this syndrome was first reported by Jaffe in 1958 as an entity with some different features from Albright's disease including limited skeletal fibrodysplasia, less striking skin changes (as pigmentation), and absence of sexual precocity. Later, more cases were reported with similar features by Campanacci et al., and Mirra et al. In 1983, Campanacci et al. published a report of 10 cases with multiple NOFs and other extraskeletal anomalies in that a new syndrome with a possible connection with neurofibromatosis was proposed. Although currently, some advocate the notion of JCS as a distinct clinical entity, close pathophysiologic relationships are present with other clinical syndromes such as neurofibromatosis type 1, McCune-Albright syndrome, and Jaffe-Lichtenstein syndrome. These syndromes share common clinical and pathologic features including skeletal dysplasia and cutaneous pigmentation with JCS. However, no global consensus has been developed yet.,,, Since a pathogenic germline NF1 mutation has been found in a recent study in such patients, it is suggested that many JCS patients actually have neurofibromatosis. Recently, a role for melatonin has also been proposed for the above spectrum of syndromes. Due to this overlap, misdiagnosis, especially at presentation, is not uncommon or surprising. JCS is clinically characterized by multiple skeletal lesions of NOF, café-au-lait spots on the skin, cardiovascular malformations, etc. Radiologically, findings compatible with NOF, although require distinguishing from polyostotic fibrous dysplasia, are evident involving the skeleton in various regions. Therefore, X-ray bone imaging seems to be the primary modality for evaluation of skeletal lesions.,,, Radionuclide imaging modalities including99m Tc-MDP bone and99m Tc-octreotide scans can be considered as adjunct tools mainly for evaluation of the true extent of the disease and possibly for biological activity of lesions. In addition, based on the degree of uptake on99m Tc-octreotide scan, a role for radionuclide peptide therapy can be considered for locally aggressive somatostatin receptor-positive lesions to prevent pathologic fracture in weight-bearing bones. The bone scan can localize the lesion with much better clarity as in our patient. To the best of our best knowledge, no radionuclide study has been performed in the more than thirty patients with JCS reported in the literature. The multiple NOF lesions caused a debilitating morbidity to the patient, but it seems that the leading cause of death was the sarcoma in the thorax. As many reports in the literature, a pathologic fracture is a common clinical picture at presentation. To date, to the best of our knowledge, no death or concomitant malignancy is reported shortly following the diagnosis which requires a particular attention. Hau MA, Fox EJ, Cates JM, Brigman BE, Mankin HJ. Jaffe-campanacci syndrome. A case report and review of the literature. J Bone Joint Surg Am 2002;84-A:634-8. Mankin HJ, Trahan CA, Fondren G, Mankin CJ. Non-ossifying fibroma, fibrous cortical defect and Jaffe-Campanacci syndrome: A biologic and clinical review. Chir Organi Mov 2009;93:1-7. Cherix S, Bildé Y, Becce F, Letovanec I, Rüdiger HA. Multiple non-ossifying fibromas as a cause of pathological femoral fracture in Jaffe-Campanacci syndrome. BMC Musculoskelet Disord 2014;15:218. Jaffe HL. Tumors and Tumorous Conditions of the Bones and Joints. London: Henry Kimpton; 1958. p. 83-91. Campanacci M, Laus M, Boriani S. Multiple non-ossifying fibromata with extraskeletal anomalies: A new syndrome? J Bone Joint Surg Br 1983;65:627-32. Mirra JM, Gold RH, Rand F. Disseminated nonossifying fibromas in association with café-au-lait spots (Jaffe-Campanacci syndrome). Clin Orthop Relat Res 1982;168:192-205. Colby RS, Saul RA. Is Jaffe-Campanacci syndrome just a manifestation of neurofibromatosis type 1? Am J Med Genet A 2003;123A: 60-3. Abdel-Wanis ME, Kawahara N. Skeletal disorders associated with skin pigmentation: A role of melatonin? Med Hypotheses 2003;61:640-2. Stewart DR, Brems H, Gomes AG, Ruppert SL, Callens T, Williams J, et al. Jaffe-Campanacci syndrome, revisited: Detailed clinical and molecular analyses determine whether patients have neurofibromatosis type 1, coincidental manifestations, or a distinct disorder. Genet Med 2014;16:448-59. Sevencan A, İnan U, Köse N. A new syndrome mimicking Jaffe-Campanacci syndrome: A case report. Eklem Hastalik Cerrahisi 2013;24:46-8.